Mary Wollstonecraft Shelley wrote her famous novel Frankenstein, or the Modern Prometheus in 1818. John Clute in his Science Fiction, The Illustrated Encyclopedia says that this was the birthday of science fiction. The Island of Dr. Moreau was written by H.G. Wells in 1896, and the famous Frankenstein movie with Boris Karloff as the monster came out in 1931. Somewhere in between (1913) came Edgar Rice Burroughs and his “Number Thirteen” (A Man Without A Soul) -- The Monster Men. Porges tells us that Burroughs thought his story had “damphool possibilities,” and it certainly did because it is a very good read, coming at the beginning of his writing career when his inspiration was red hot. The Monster Men was written between The Cave Girl and The Warlord of Mars when it seemed he could do no wrong. The hero of the story, Bulan, is number 13 of the experiments performed by Professor Maxon, and he turns out to be a perfect specimen of a man in body and mind. The only problem is there are 12 “monsters” created before him running around on a jungle island with Maxon’s pretty daughter, Virginia, needing saving time and again. Despite the corny sounding plot, it is actually vintage Burroughs that deserves attention. 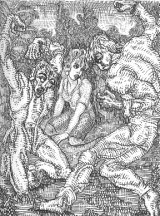 Lupoff says that “The Monster Men is a curious tale, crudely told even for Burroughs whose style was more frequently admirable for vigor than for its polish.” However, he goes on with some enthusiasm for the work. “Bulan knows that only God can breathe an immortal soul into a living person. Bulan therefore doubts that he can share with Virginia the sacrament of marriage. This is a serious question, and receives serious treatment” (Lupoff, 82). Clute points out the interesting fact that this science fiction genre of creating life out of dead bodies and chemical vats expanded into mixing life with machines in the Cyberpunk novels of the 1980’s. “William Gibson captured the new age in the trilogy that began in 1983 with Neuromancer, and became part of the vocabulary of SF by about 1985 . . . “(Clute, 88). 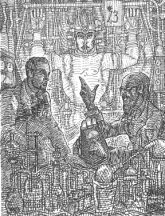 Clute refers to Mary Shelley in relation to Cyberpunk, giving credit where credit is due. “There is something about this dark, atmospheric, lightning-lashed tale that makes one feel that Baron Frankenstein has become entangled in a massive and filthy world machine, that he has caught himself and his monster in the gears of a terrifying scientific technology, and that the systems of this new world are making him dance to their tune. Baron Frankenstein is a bit like Gibson’s hero, Case. Frankenstein is a victim of his overweening pride, which has deluded him into the belief that he is the master of the new world of science, which then turns on him; Case is a victim of his own streetwise audacity, and becomes a pawn in the hands of the new gods of cyberspace” (Clute, 88). It is amazing that little Mary Shelley could have started all of these monsters shuffling. Brian Aldiss notes that “Mary had imbibed the scientific ideas of Darwin and Shelley; [her husband - Percy Byshe Shelley, the poet] had heard what they had to say about the future; and now set about applying her findings within the loose framework of a Gothic novel” (Aldiss, 21). She wrote Frankenstein before she was twenty years old. It is no surprise that ERB wanted to try his hand at this “new myth,” as Aldiss puts it. “ . . . the use of this modernized Faust theme is particularly suited to the first real novel of science fiction: Frankenstein’s is ‘the ’ modern theme, touching not only science but man’s dual nature, whose inherited ape curiosity has brought him both success and misery” (Aldiss, 29). Porges, Irwin, ERB, The Man Who Created Tarzan, Brigham Young University Press, 1975. 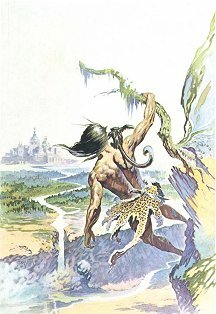 Bozarth, David Bruce: The Monster Men: A Play, Copyright (c) 1982,1997 (Adapted from “The Monster Men” by Edgar Rice Burroughs) Available at his site. ERBapa #54, Summer 1997 was the “Symposium Issue” for The Monster Men, and The Eternal Lover, which means that the contributors were encouraged to write something on these novels. 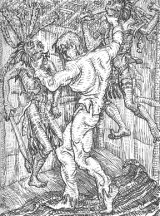 There are many reproductions of Monster Men illustrations from ERB books and magazines in this issue and these 7 articles. If you are interested, you might contact the writers and ask or beg for a copy. reading the novel and my feelings afterwards. Cuthbert, Raymond A. - “Number 13, A Modern Prometheus?” - an interesting treatment of “The Man Without A Soul” issue. Like Lupoff, Cuthbert feels cheated by the surprise ending of the story. Hanson, Alan - “The Monster Men: A Chrono-log” - 6 pages of very clear charts that show how the story unfolds, revealing at a glance what each character is doing in the same time period. Huckenpohler, J.G. - “ERB and the Concept of Artificial Life” - a comparison of Maxon with Ras Thavas. 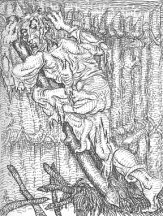 Martin, John - “ ‘When the Sleeper Wakes’: A Story-Telling Technique Spawned in The Monster Men” - an outstanding article - demonstrates “the sleeper” in The Monster Men, Tarzan the Terrible, Tarzan Triumphant, and Tarzan and the City of Gold. 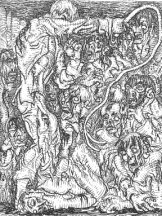 Spencer, Paul - “ERB Revisited -- Part XXI: The Monster Men” -- a discussion of characters and plot, concluding that it is third-rate Burroughs.